* This product is priced in Singapore Dollar (SGD), AUD rates can fluctuate depending on exchange rates, final rates in AUD will be confirmed by your consultant at time of booking. The Fullerton Bay Hotel Singapore, located on the waterfront at Marina Bay, recently opened on 8 July 2010. The hotel, which recently joined Preferred Hotels & Resorts, features 100 rooms, five individually-themed suites and a Presidential Suite. LCL Architects, the group behind the hotel’s glass facade, is also responsible for the creation of the luxury hotel rooms, whilst the arrival experience and restaurants are the latest projects by design wunderkind, Andre Fu. 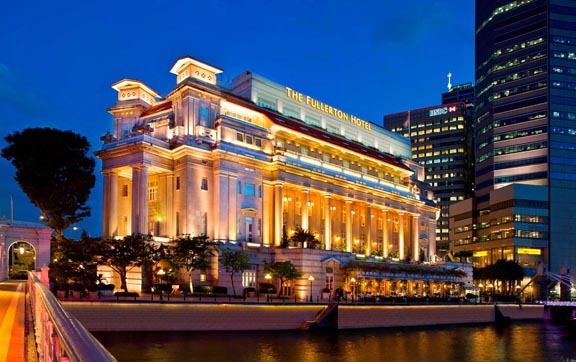 Guests will enter the hotel through a 17-metre wide lobby at the historic Clifford Pier, an important heritage site which saw the arrival of many of Singapore’s early settlers. The hotel’s interior designs are richly steeped in Singapore’s vibrant history with Fu using vintage nautical maps and commissioned contemporary art that reflect the celebration of heritage and modernity in the Lion City. Utilising materials and designs such as polished rosewood and latticed screens, as well as leather and chrome, LCL Architects has created an elegant and refined atmosphere in the bedrooms with a predominantly natural palette throughout. This classical look is combined with state-of-the-art in-room technology to ensure that the hotel’s travellers are never out of touch.